CHICAGO - Seven people, including three 15-year-olds, have been charged in connection with a machete attack on a man at a Chicago public transit station, police said. The suspects surrounded two men early Monday at the Kedzie Brown Line station and told them to flash gang signs, police said. 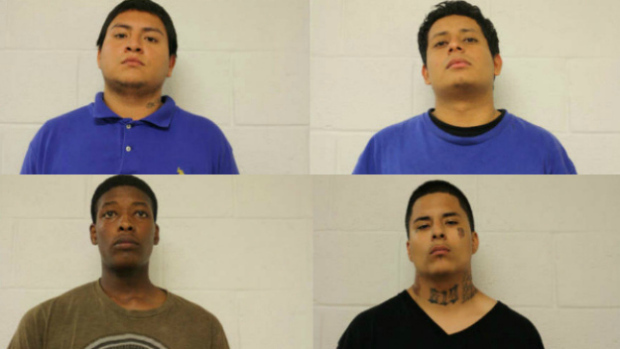 The men, ages 17 and 26, refused and said they weren't in a gang. The Chicago Sun-Times reports 18-year-old Mario Elvira swung at the men with a machete, hitting the 26-year-old on the head and neck, according to police. They said the victim was taken to a hospital with cuts and his condition has stabilized. Four adults were charged Tuesday with one count each of robbery, aggravated battery and trespassing on Chicago Transit Authority property, authorities said. Two boys and one girl, all 15 years old, were charged with trespassing, and one of them was charged with aggravated assault. One adult suspect was ordered held on $450,000 bond and two were ordered held on $250,000 bond, the Cook County Sheriff's Office said. Bond information was not immediately available for the fourth.